Whether you’re at home or on the go, this stunning make up bag from the Paint collection by Disaster Designs is the perfect way for housing your cosmetic collection in style! 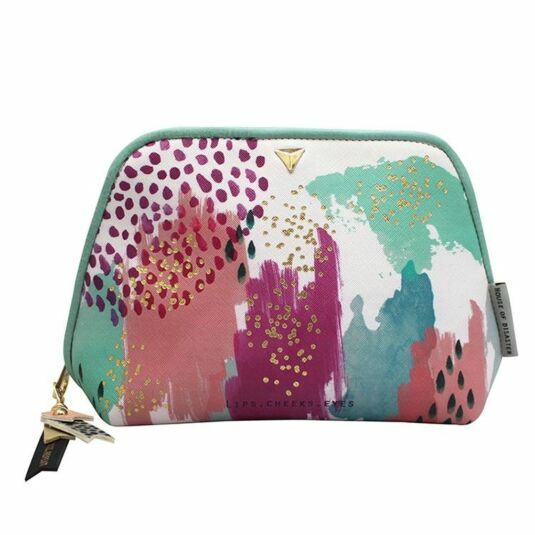 Made from faux leather, it features a multi-coloured design, made up of brushstrokes and paint splatters alongside gold foil accents and the words ‘Lips, Cheek, Eyes’. The back of the bag is turquoise, matching the piping and the zip which is finished with a zip pull featuring four pieces of faux leather ribbon in complimentary colours and designs, the longest reading ‘Open, Close, Repeat’. Perfect for stashing your toiletries in whilst on holiday, this stunning make up bag will also look fabulous on your dresser or vanity table at home. It would make a brilliant birthday or Christmas gift for anyone off on holiday or someone who likes to stay neat and tidy at home thanks to its colourful pattern and sturdy design. The paint range from Disaster Designs has taken inspiration from the watercolour style of painting featuring bright colours merging into each other. The combination of bold shapes and gold accents has created eye catching designs which have been beautifully presented a range of fashion accessories.